Zoe Saldivar is more than just singleshe's ALONE. She recently broke up with her longtime boyfriend, she works from home and her best friend Jen is so obsessed with her baby that she has practically abandoned their friendship. The day Zoe accidentally traps herself in her attic with her hungry-looking cat, she realizes that it's up to her to stop living in isolation. Her seemingly empty life takes a sudden turn for the complicatedher first new friend is Jen's widowed mom, Pam. The only guy to give her butterflies in a very long time is Jen's brother. And meanwhile, Pam is being very deliberately seduced by Zoe's own smooth-as-tequila father. Pam's flustered, Jen's annoyed and Zoe is beginning to think "alone" doesn't sound so bad, after all. 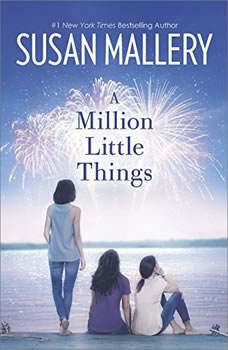 Friendship isn't just one thingit's a million little things, and no one writes them with more heart and humor than book club sensation Susan Mallery! Author Susan Mallery is a New York Times best-selling author, and has written more than 80 Harlequin and Silhouette romance books, and a number of full-length romance novels. Unbelievably, she began writing in this genre after taking a class offered st a local community center entitled, "How to Write a Romance Novel". It seems almost too simplistic to believe. She now has more than 25 million books sold worldwide. She is known for creating characters who are as familiar as the people next door. They are usually involved in emotional, funny situations that the reader can easily identify with in their own lives. Susan Mallery grew up in southern California, and admits to moving so many times that her friends used a pencil so her address could be easily changed. She is very much interested in animals and their well-being, so she incorporates various pets in her stories. Mallery's books have been translated into 28 languages. She lives in Washington state with her husband, two cats, and a small poodle who, as she describes it, "has delusions of grandeur". An interesting side Story is that her friend, author Debbie Macomber gave her a bottle of champagne to open when she had her first New York Times #1 selling novel. In August 2015, she finally made the #1 list with her novel, Thrill Me, which debuted at the #1 spot. Mallery opened the champagne the night she found out the news, and raised a toast to Debbie and to her great readers who helped her reach that goal. Susan Mallery always promises another year of happy books, and wishes her fans happy reading!